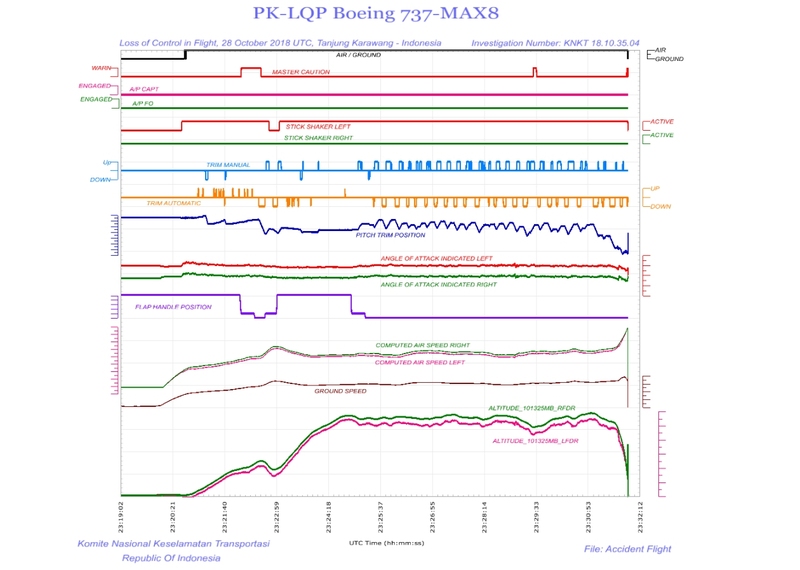 NTSC Indonesia published a preliminary report on the Lion Air B737 MAX 8 accident of October 29, showing the flight crew was struggling to maintain control after takeoff. Lion Air flight 610 crashed into the sea shortly after takeoff from Jakarta-Soekarno-Hatta International Airport, Indonesia, killing all 189 on board. According to the preliminary report, the Aircraft Flight Maintenance Log (AFML) recorded that since October 26 until the occurrence date several problems occurred related to airspeed and altitude flags that appeared on the captain’s (left) Primary Flight Display (PFD) on three occasions, SPEED TRIM FAIL light illumination and MACH TRIM FAIL light illumination that occurred twice. Several attempts were made by engineers to rectify these issues. The day before the accident the Angle of Attack (AoA) sensor was replaced by engineers at Denpasar Airport. The flight from Denpasar to Jakarta was the flight prior to JT610. During rotation, the stick shaker activated and an IAS DISAGREE warning showed on the captain’s PFD at 400 feet. The flight was handled by the copilot as it was determined that the captain’s PFD was unreliable. The flight crew moved the STAB TRIM (stabilizer trim) switch to CUT OUT due to three automatic nosedown trim occurrences. The crew worked checklists and continued the flight to CGK. Based on the crew’s entry in the AFML, the engineer at Jakarta flushed the left Pitot Air Data Module (ADM) and static ADM to rectify the reported IAS and ALT disagree and cleaned the electrical connector plug of the elevator feel computer. The aircraft was subsequently released to carry out flight JT610. During takeoff from Jakarta, the DFDR recorded a difference between left and right Angle of Attack of about 20° which continued until the end of the recording. During rotation of the aircraft, the left control column stick shaker activated and continued for most of the flight. After the flaps were retracted, the FDR recorded automatic aircraft nose down (AND) trim for 10 seconds followed by flight crew commanded aircraft nose up (ANU) trim. Automatic AND trim briefly stopped when the flaps were temporarily extended to 5. In their communications with air traffic control, the flight crew asked the controller to confirm the altitude of the aircraft and later also asked the speed as shown on the controller radar display. The copilot reported experiencing a “flight control problem” and that they were flying the aircraft manually. Last radio contact was at 06:31 local time when the captain requested the arrival controller to block altitude 3,000 feet above and below for traffic avoidance. The controller asked what altitude the pilot wanted, to which the captain responded “five thou”. The controller approved the pilot request. The FDR stopped recording within twenty seconds of the pilot’s response.